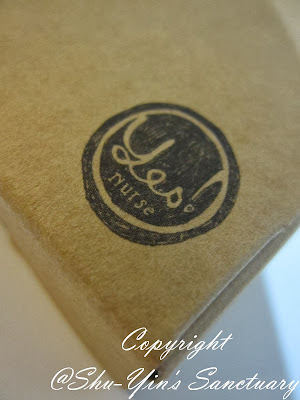 A team of beauty junkies from The Love Jars sent me this life-saving Yes!Nurse Hand Cream. 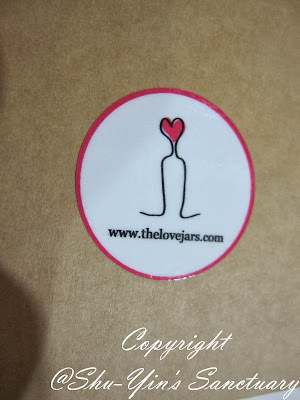 SO WHO ARE THE LOVE JARS? The Love Jars are a team of women beauty junkies who tested tons of beauty products, and then handpicked those that they truly love. They are committed in delivering a collection of award-winning, internationally renowned brands to us. And the best thing is, the brands are priced within the international price range, giving us quality yet affordability. SO WHAT IS YES! NURSE? Yes! Nurse was co-founded by a young paediatric nurse in 2009. She had dry, cracked and sore hands having been signed off work. She also noticed that many of her colleagues were suffering in the same way. 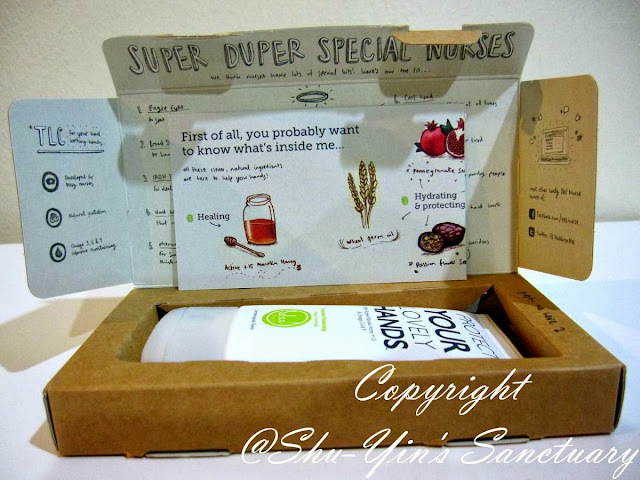 She tried numerous hand creams with little or no effect, and then she decided to research and develop a unique formula that actually worked, and that is the now Yes! Nurse Hand Cream. 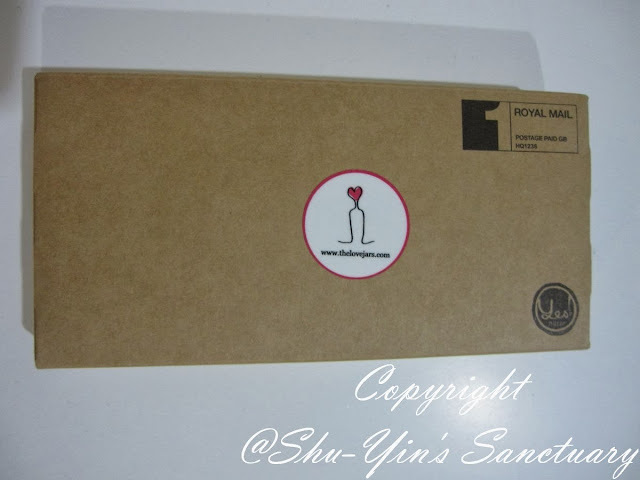 The package arrived my door step, and I was happy to see the pink ribbon packaging. How thoughtful of the people from The Love Jars. 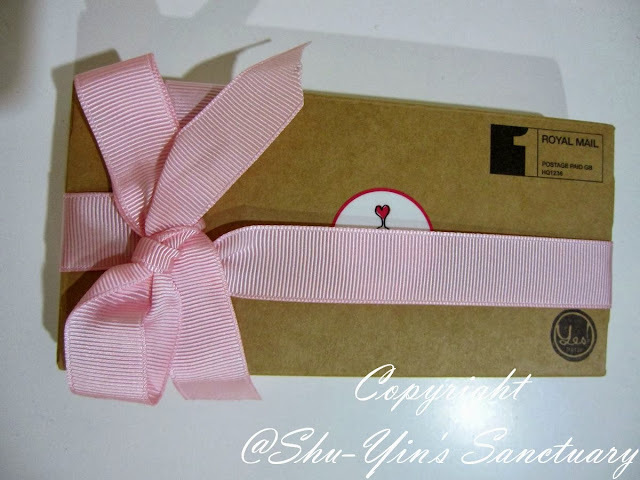 The perfectly tied pink ribbon made the slim box packaging made it so much more sweeter. 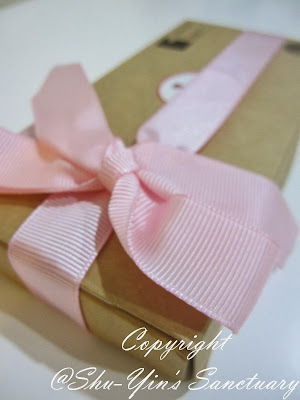 And I can also reuse this pink ribbons for my scrapbooking projects. Yay! The top right hand corner is a printed stamp of the Royal Mail. And the bottom right hand corner is the Yes! Nurse logo, in black and white. In the middle is the www.thelovejars.com sticker. Opened the package and I was blown away! What a seriously neat package! So the Yes! 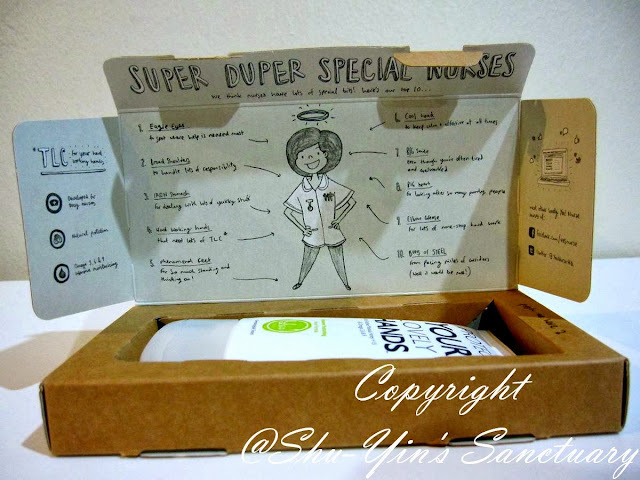 Nurse people definitely win top prize for its whimsical artsy package cardboard design, the best I've ever seen. It lists out all the ten explanations of 'special bits' of all super duper special nurses, with a smiley drawing of a nurse! It makes me appreciate and read the little acknowledgements of the hard work the nurses put into what they do. So, what's in every bottle..
their unique ability to protect and hydrate your skin throughout the day. 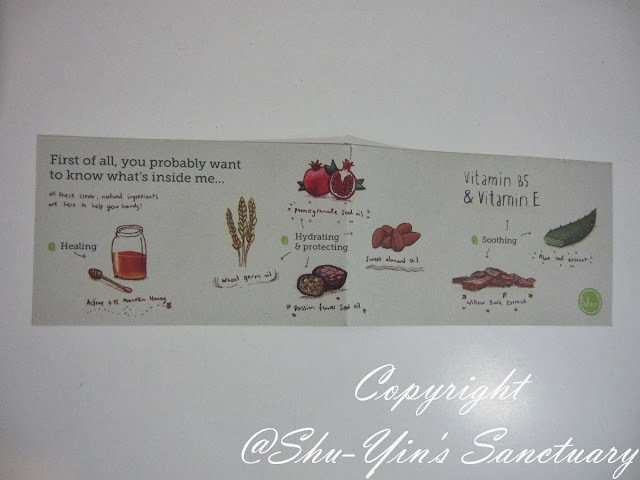 Love the natural ingredients and how they explain it to us through the diagram. 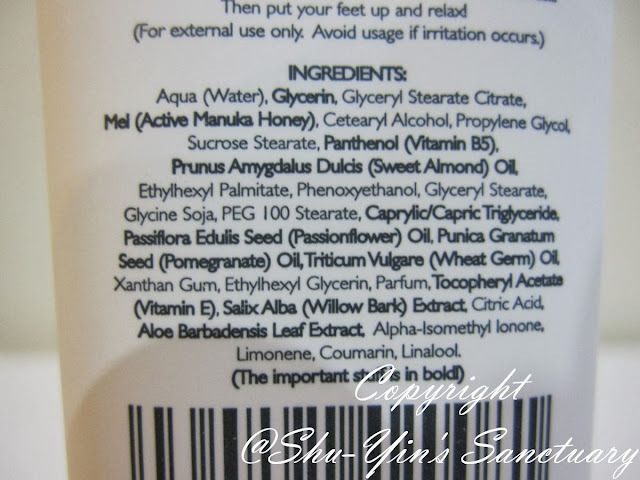 The ingredient list behind the tube. 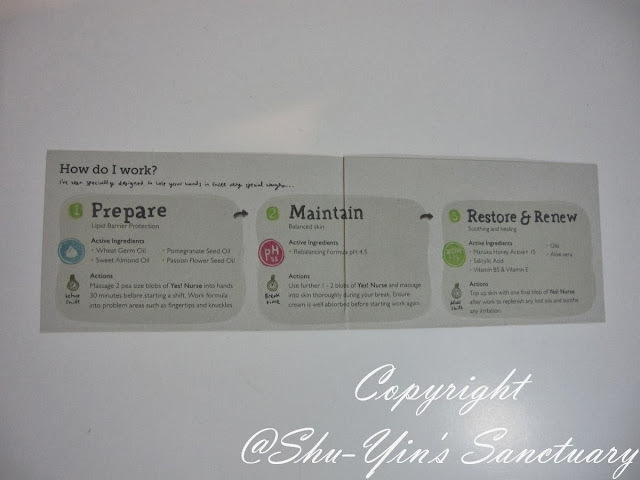 Flip the paper to the other side and you can read the 3 steps on how to use the hand cream. But it is written especially for those super duper nice nurses. Finally, the product - the hand cream. 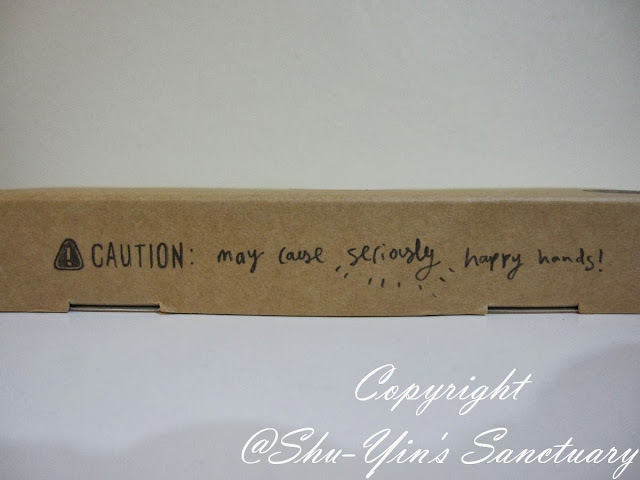 On very large fonts, it is written: Protect your lovely hands. The size of this tube is slim and not too big, perfect to pop into my diaper bag or even my hand bag, so it is great even for on-the-go. Love its slim design packaging. Another good thing about the packaging is that the ends of the tubes are not sharp, thus it does not damage your handbag when you keep it inside it. I hate those really sharp ends of some of the tubes that poke and damage my handbags, if you get what I mean. I usually hated to apply hand creams. Because they always leave my hands feeling all greasy and yucky and I use my laptop and iPhone alot all the time, and I hate them feeling greasy as well. But, Yes! Nurse hand cream is REALLY as good as what it claims to be! It is TOTALLY non-greasy (which is very important to me as I hate greasy hands! ), and is fast absorbing as well. Just squeeze a pea-sized drop or two onto your hands, and then massage it into your hands, working into problem areas such as knuckles or fingertips. Love that just a drop goes such a long way! Totally value for money. A 50ml tube last a long time! For mums like me who washes my hands a hundred and twenty four times a day (after every nappy change, tons of household chores, etc), it is even more crucial for us to have a hand cream that actually works! As for the smell, it has a very mild and light, clean fresh scent to it, nothing too strong, which is good because too strong smell sometimes puts me off. Yes! Nurse hand cream totally works like magic. It hydrates and moisturizes my hands really well. I sometimes plop a drop onto my hands to protect it before doing a more thorough chore such as hand washing a bucket of clothes, or washing a basin of plates, to protect against the harsh soapy waters. 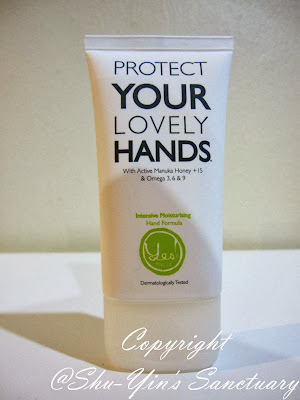 It does its job or locks in the moisture and acts like a barrier, so my hands felt really good and protected. It works well and I don't feel the grease of it at all, and after chores, my hands don't feel so dry like it used to. And you know what? 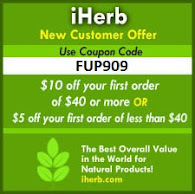 As I have really dry and dehydrated skin, I even use Yes! Nurse hand cream not only on my hands, but also on my knees and elbows as well. I also rubbed a little on my toes as I have really dry toes as well. Yes, I couldn't help it after I knew how great and moisturizing this magic tube of hand cream is. And I don't feel the grease when I slip on my heels, which is just great. Moisturizing and protecting without feeling greasy, what a great combination it is! I also hope that by using it for a longer period, it can help delay me in having wrinkly fingers and hands, though I'm not so sure if it does that. I certainly hope so. It is also very affordable too at only RM 29.90 for a 50ml tube (read below for a discount code!) and they make such a great gift not only for nurses, but for mums like me, or any other people who needs a good hand cream. 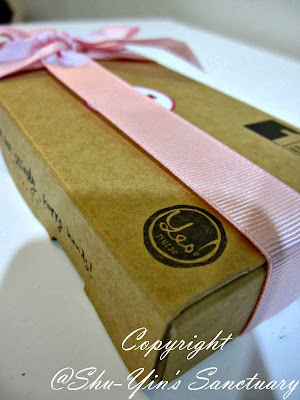 You are also entitled to FREE SHIPPING for orders over RM70For more info, you can also visit The Love Jars website or their Facebook page. Note: The expiry of an unopened unit is March 2016. However once opened, the expiry is only 1 year from the date of opening. * Disclosure: I received a 50ml tube of Yes! Nurse hand cream for review purpose, but no monetary incentive was received. All text and opinions are of my own and represents my honest opinion of the product(s).